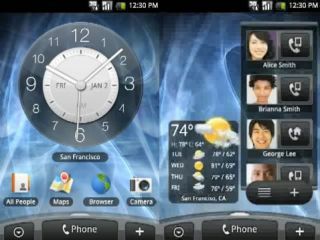 HTC's 'uber-Android' Sense UI has been ported from the Hero and Tattoo to earlier versions of the range, with the Magic the first to benefit. OK, it's only in Taiwan for the time being, but there's a chance that it could also turn up in the UK in the future too, as previously rumoured. Users of the Magic over in Taiwan will be able to update their phone via a firmware update, giving inbuilt links to Facebook and Twitter from the home screen and contacts menu. There is a slight problem though if you're getting giddy about the thought of a Hero-like experience on your UK Magic - Google could be the one blocking the upgrade. Over in Asia, the Magic uses a much less Google-branded version of the OS - meaning HTC is much more able to do what it wants with it in terms of updates. But in the UK, it's a 'With Google' phone, meaning that the Big G has a much tighter hold on the Android experience the UK gets. So it will be interesting to see if Google relents and lets a legacy device get all the Android goodies HTC is offering - if you're a Magic user, here's hoping!